5/23/17: Arguments in the appeal over the closure of the Whiteclay liquor stores are due by July 10, with a decision due in mid-August at the earliest. 5/1/17: The reversals continue. The Nebraska Attorney General's Office immediately appealed the district court decision, leaving the Liquor Commission's ruling that the stores should close in place for the time being. The stores themselves shuttered on May 1st. 4/27/17: In a staggering blow to both public health and the ability of the Nebraska Liquor Commission to play a meaningful role in protecting the public, the Lancaster County District Court overturned the commission's decision and mandating that the Whiteclay licenses be automatically renewed. The Nebraska Attorney General is appealing the decision, and the liquor stores will close on Monday until the appeal is decided. 4/19/17: The NE Liquor Commission has voted to suspend the liquor licenses for the four stores in Whiteclay. This is a resounding victory for the tireless advocates and activists of the Pine Ridge reservation, and brings hope that the tide of alcohol harm in the area will ebb. READ MORE about this victory decades in the making. There is still time to throw your support behind critics of the liquor store licenses. TAKE ACTION now to urge the liquor commission and the Governor of Nebraska to shut down the Whiteclay stores. The Commission ended the hearings late April 6, 2017. They resolved to take the hearing under advisement and render a decision on or before May 2nd. The liquor stores will continue operating as normal until then. On May 2nd, the stores licenses will either be allowed to expire or the stores can renew them as normal. 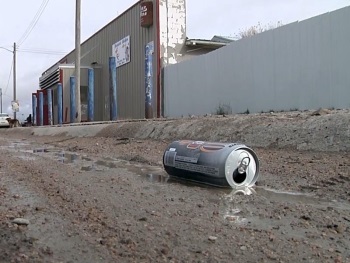 Whiteclay Redevelopment - an effort by Whiteclay street ministry to buy out and close down the liquor stores.